Obuasi, May 28, GNA - President John Agyekum Kufuor on Friday asked mining companies operating in the country to make inputs that would assist all stakeholders in forging a partnership to promote growth in the mining industry through the new Mining Law. He said such inputs should also ensure the establishment of a durable and harmonious relationship beneficial to all stakeholders. President Kufuor made the call when launching AngloGold Ashanti at Obuasi, in the Adansi West District. The managements of both AngloGold of South Africa and Ashanti Goldfields Company (AGC) of Ghana concluded agreement for the merger in April this year after negotiations had begun in 1999. The merger has resulted in the creation of an African giant in the mining industry with a market capitalisation of about 10 billion dollars. AngloGold Ashanti now operates 22 mines in 11 countries including Ghana, Brazil, the US, Australia, Mali, Guinea and South Africa. President Kufuor asked the companies in addition, to continue to sharpen their sensitivity to the needs and realistic aspirations of the communities in which they operate. "In particular, the need for mining companies to forge important linkages with the local economy while they work together towards a much improved business environment, cannot be over-emphasised", he added. President Kufuor commended the management of AngloGold Ashanti for their resolve in the control and treatment of HIV/AIDS and malaria in the communities where they operate. He said the merger of the two companies had ushered Ghana and Africa onto the global business scene in an appropriate manner. President Kufuor said the government endorsed the merger because it saw the proposition as a way of promoting the country's private sector and also proving to the world's investor community that Ghana was a congenial investment destination. He said over the last couple of years two other mining companies had taken some giant steps in the country. 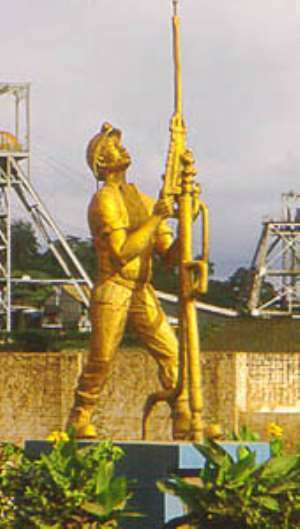 They include Newmont Mining Company, currently reputed to be the world's leading gold producer, which is preparing to construct two gold mines in the Eastern and Brong Ahafo region. President Kufuor said Goldfields Ghana Limited, operating the Tarkwa and Damang mines in the Wassa District in the Western Region was investing an additional 500 million dollars to expand its existing operations in Ghana. "These developments will create hundreds f job opportunities for our youth and also utilize the indisputable mining skills available in the country", he added. Dr Sam Jonah, President of AngloGold Ashanti said the merger had certainly represented a high point in the relationship between Ghana and South Africa, adding" together we have succeeded in creating a world leader from Africa".